Twelve teams took part in the seventh Khandallah Mixed Doubles. Two teams went through the three qualifying rounds undefeated: first time entrants Gabi Kinnell and John Pallesen and 2014 champions Jack and Linda Gazzard. In the Trophy semi-final, Kath Alison and Michael Rocks reversed their morning result against Jack and Linda to qualify for the final against Gabi and John. In the final, Gabi and John raced out to a 7-0 lead before Kath and Michael pegged them back. Going into the final end, Gabi and John were down 10-11, but they picked up 1 to tie the scores. An extra end to determine a winner was required as the prizes couldn't be split! Kath and Michael won the end to each win the Mixed Doubles for the third time, although it was their first time together. Barbara Nicholls and Brian Smith won the Plate 13-11 over Bob Horton and Lynley Watt. The Bowl was won by Simon Grant and Robin Mann from Wayne Green and Colleen Horton. Kapiti's first defence of the Jacques Cochonnet Trophy was away at Horowneua. Kapiti took the early lead winning the first two rounds by 2 games to 1. Previous history. Kapiti's next defence will be at home to Otaki. Twenty-four players took part in the Regional Women's Singles at Horowhenua. After four 50 minute timed games in the morning, Shirley MacDonald, Annick Le Guen and Catherine Maher were the only undefeated players. However, all three were eliminated in the Trophy quarter-finals in the afternoon. In the Trophy final, Ann Hogg (Otaki) beat Sue Gurr (Wanganui East) 13-5. The Plate was won by Yvonne Futcher (Wanganui East) who beat Trish Smart (Manawatu) 13-8. The Bowl was narrowly won by Lee Anne Bird (Wanganui East) 13-12 from Shirley Madgwick (Wanganui East). The video of PNZ National Triples Championship final is now on the Wellington Pétanque YouTube channel. Note: There is an issue with the picture quality, but it is possible to follow the actual match. 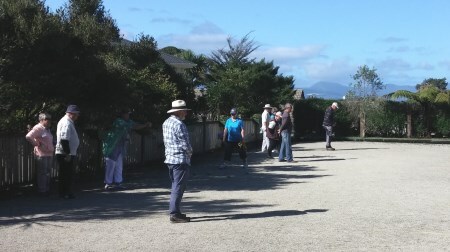 Notice is hereby given that the Annual General Meeting of the Wellington Pétanque Association (Incorporated) will be held at 3:00 pm on Saturday, 18 June 2016 at the Kapiti Pétanque Club, Paraparaumu Domain, Aorangi Road, Paraparaumu. Any Club or member wishing to have a remit or motion presented to the AGM should submit it to the Secretary as soon as possible, and by 31 May 2016 at the latest. A further notice advising the details of any remits/motions will be sent to Clubs two weeks in advance of the AGM. The closing date for nominations is 31 May 2016. Position descriptions President (190kB), Secretary (189kB) and Treasurer (189kB). Draft Minutes from the WPA Committee Meeting held at Kapiti on 14 April. Eighteen teams took part in the Murrayfield Open Triples at Otaki. 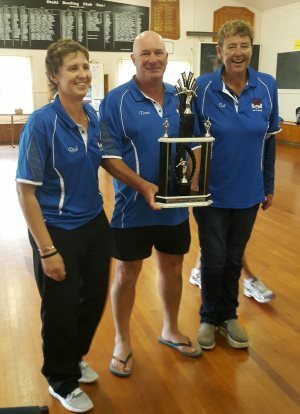 Four teams finished with 4 wins and it was the Wanganui East team of Lee-Ann Bird, Dene Futcher and Sue Gurr who took first place on points differential. Nominations have now closed for the 2015-16 WPA Regional Awards. A total of 11 nominations were received. The category winners will be announced at the WPA Annual General Meeting on 18 June, 2016. Two more nominations have been received that were posted on Friday. The video of WBS Open Triples final at Masterton is now on the Wellington Pétanque YouTube channel. Kapiti's second defence of the Jacques Cochonnet Trophy was against Otaki. On their home terrain Kapiti easily over-powered the vistors, romping to an 8-1 victory. Kapiti's next defence will be away to Silverstream. The video of Hawke’s Bay Autumn Triples final at HBLTS, Napier is now on the Wellington Pétanque YouTube channel. The agenda for the 2016 Annual General Meeting to be held at the Kapiti Pétanque club on Saturday, 18 June.